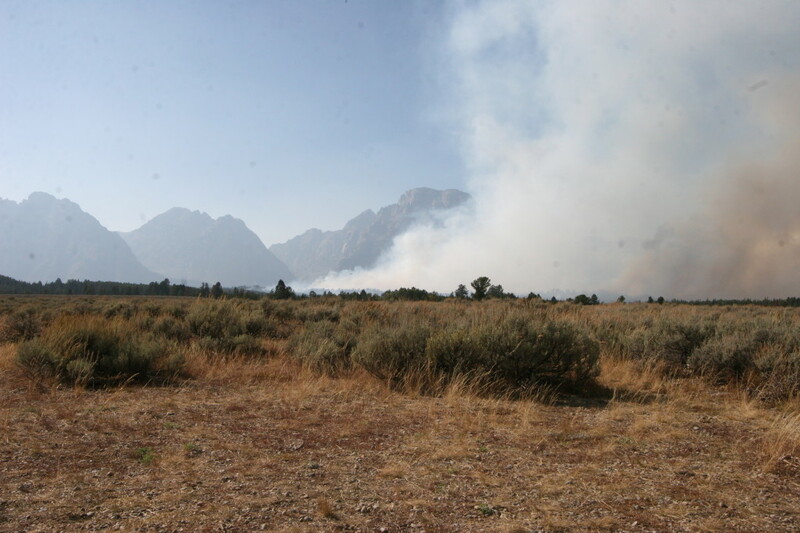 It’s mid-September, and the Grand Teton National Park is on fire. Slender tendrils of smoke rise into the sky like the flags of an invading army laying claim to enemy territory. 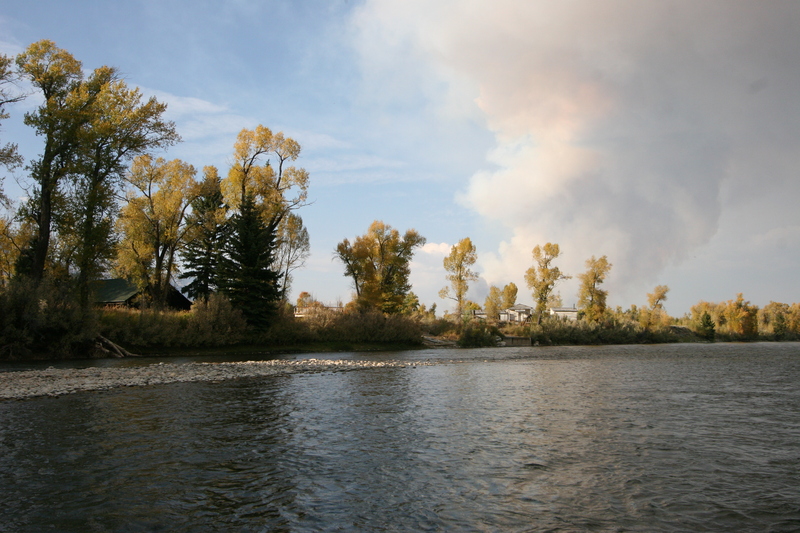 There are five different fires in the park the day I arrive; two prescribed burns to control overgrown areas, and three that occurred naturally as a result of recent lightning strikes. The forest service keeps an eye on things to ensure that the fires don’t threaten historic structures. Otherwise, the fires are permitted to die out naturally. 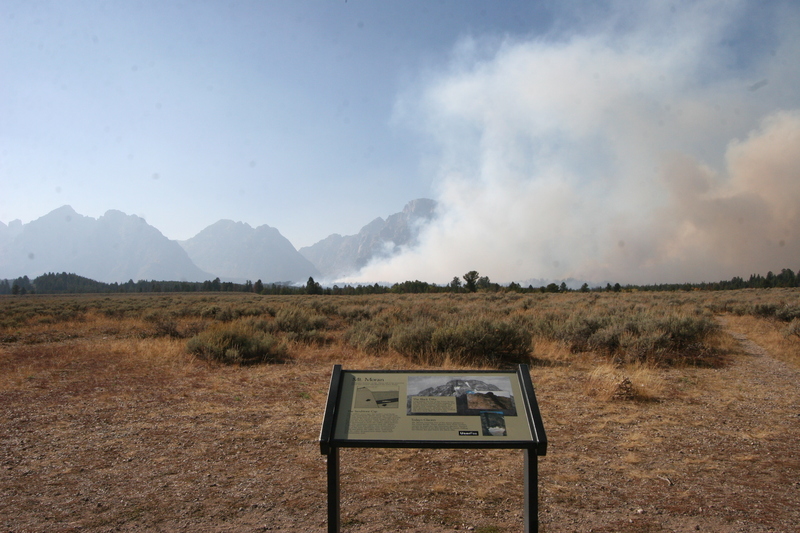 One of three fires in Grand Teton National Park during my visit. But by the following afternoon, one of the columns of smoke has grown huge; the fire has apparently found something that it really likes to eat and is moving voraciously through the park. Now the rangers are interested. Barricades go up and roads close down. 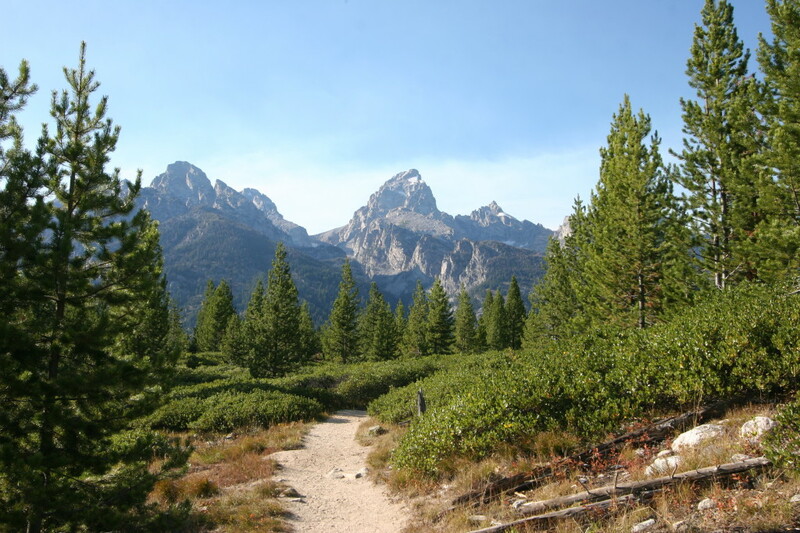 The crystal clear views of the Tetons are now seen through a haze and the air tastes like downtown Los Angeles. The helicopters and fire-jumpers are going to have to tamp this one down a bit. I look away from the storm cloud of smoke at the magnificent scenery all around me, and my heart despairs at the loss of it. 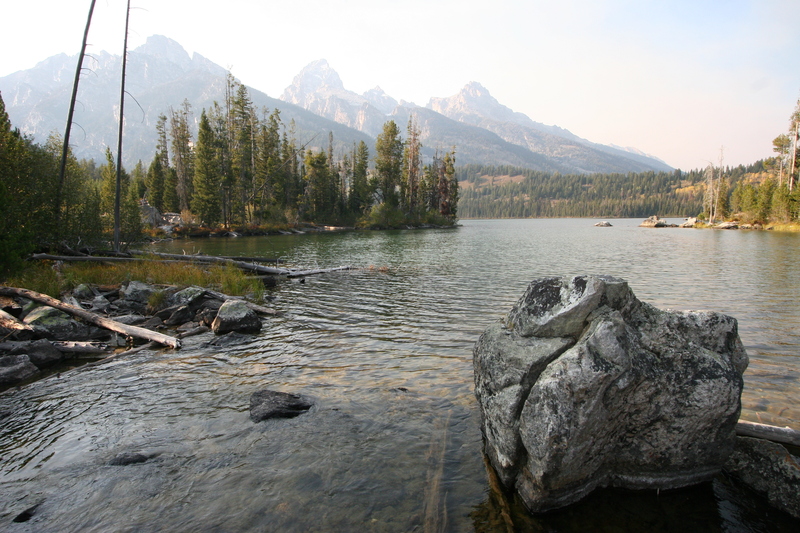 But as I am soon to learn, those fires are saving the forest, and this weekend in Jackson Hole and Grand Teton National Park was a lesson in loving the lifecycle of the parks by embracing our role in it. What’s the Land Doing Way Up There? 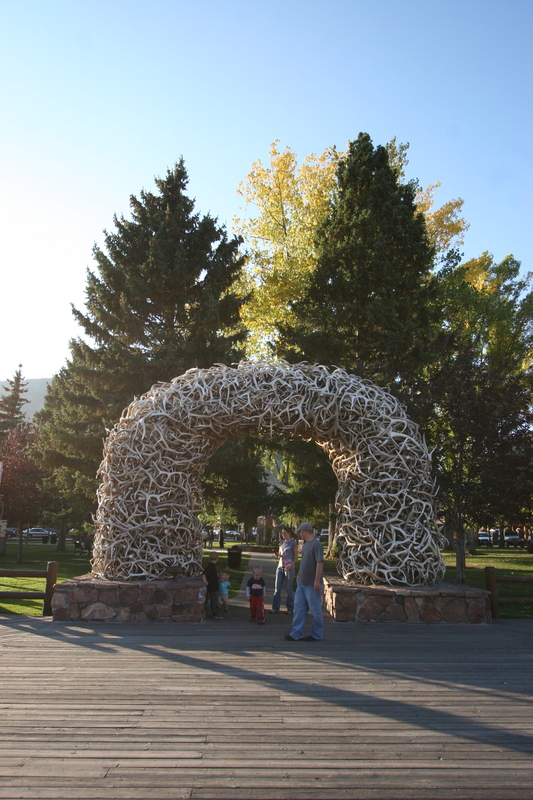 Jackson Hole is sometimes thought to be the name of the town that sits inside it, but the town is properly called simply Jackson, and Jackson Hole is the valley between the Grand Teton Mountain Range and the Gros Ventre mountains, a verdant meadow flanked by giants. 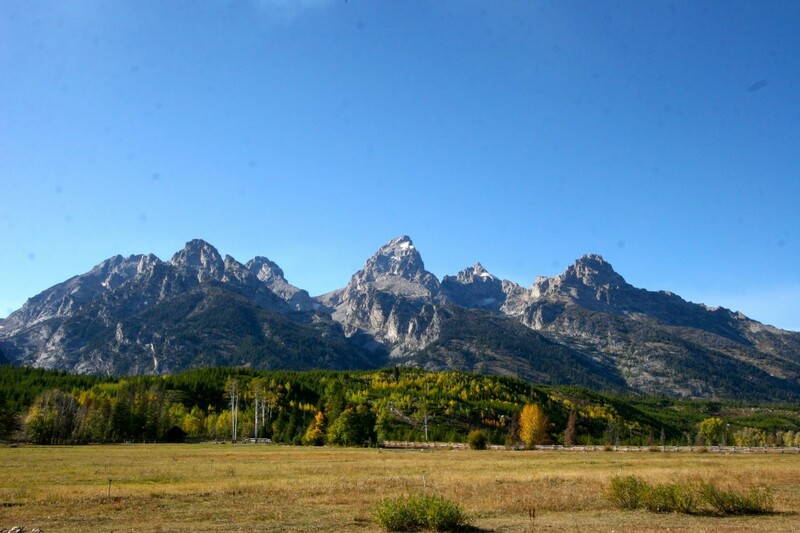 The Great Smoky Mountains are sleepy, forest-covered undulations of green; the Alps a varied geological riot, and the Rockies are a majestic procession that you rise into over great distance before reaching their culminating peaks. 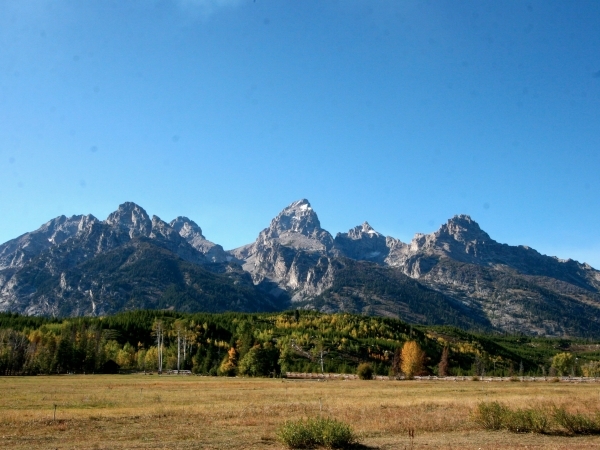 By contrast, the Grand Tetons are nearly hallucinatory. There is no gradient rise in the land; no tribune foothills announcing what is to come. The three giants that make up what is called The Cathedral Group instead appear to erupt without warning out of the flat plain, like ICBMs suddenly arisen from a missile silo in a Kansas wheat field. Looking over from the main road that cuts through the park, they seem jarringly near, as if you could just walk over and touch them. They’re that close. Most amazing of all perhaps is that the disruption in the earth that gave birth to them has helped create such an inspiring ecosystem. 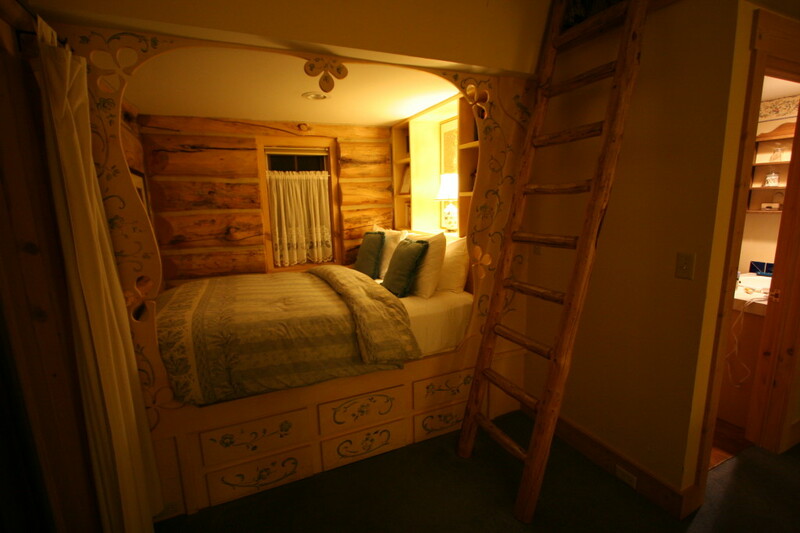 A cozy bed at the end of the day at The Bentwood Inn. I check into the Bentwood Inn in Jackson Hole, a completely charming bed & breakfast that lies invitingly at the end of a wooded drive. The morning of my arrival, a moose wanders through the backyard. Later on in the day, two bald eagles get into a shouting match with a hawk while ravens take side bets and add color commentary. Oh, yeah. It’s close to the park, alright. The Inn also offers a view on the cycle of renewal here, as it was built from massive, 200-year-old timbers salvaged from another fire in the parks. It’s a classic Alpine structure, oozing charm and elegant rusticity, with a three-story stone fireplace providing a central axis for the handful of well-appointed rooms. The rooms themselves feature pamper-me bathrooms with spa tubs and handmade salt exfoliating rubs infused with peppermint oil resting on bundles of fluffy cotton towels. And the hearty breakfasts, afternoon wine and cheese, and Friday night bistro-style dinners are like the Inn itself: high-end experiences artfully constructed from a small number of carefully considered, high-quality ingredients. Sitting before the towering fireplace in the evenings here, you can’t help but reflect that this welcoming retreat was made possible by the destructive power of those flames that now serve as the inn’s living heart. 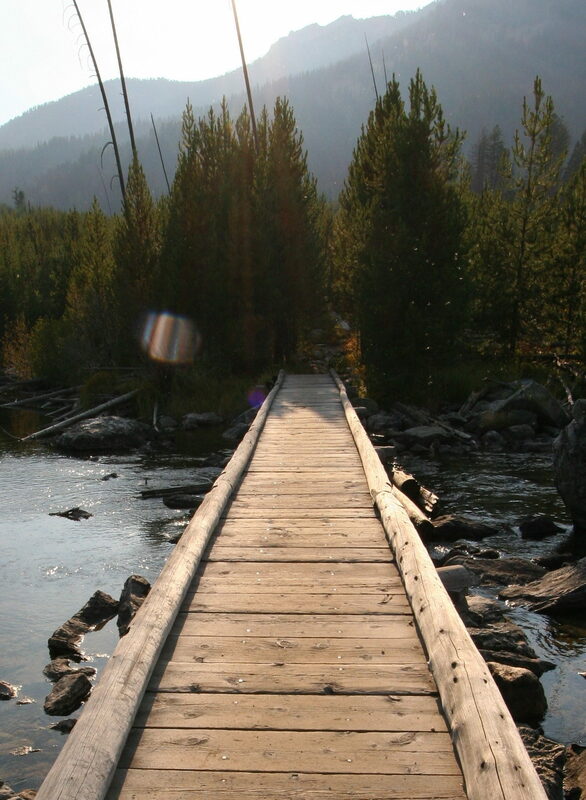 Hiking the backcountry with Yellowstone Outfitters. 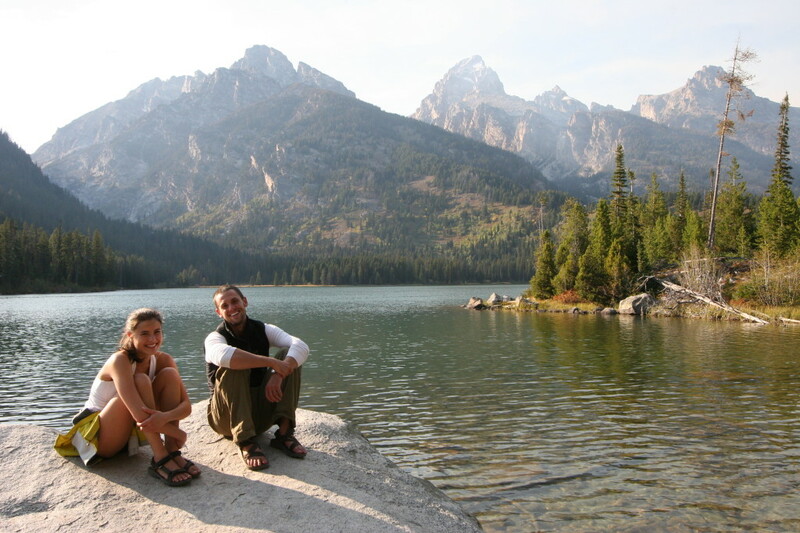 Yellowstone Outfitters is a family-run enterprise with a summer base camp in the Teton Wilderness. 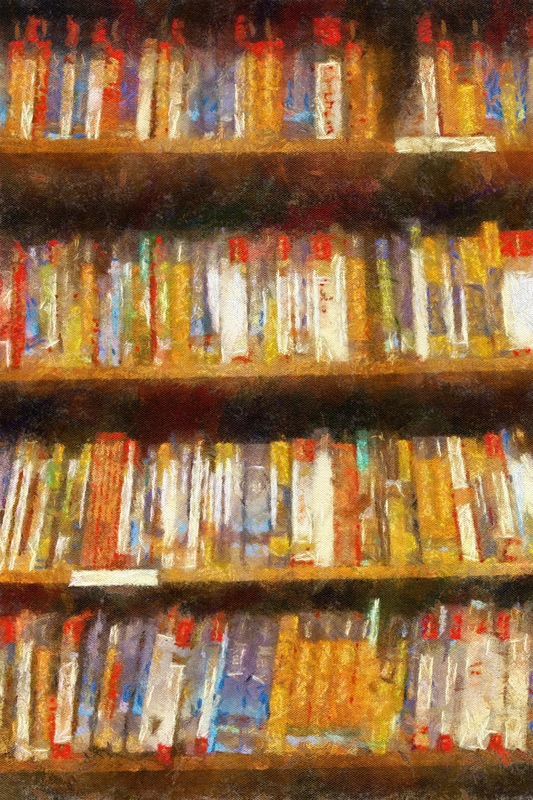 They offer 2-hour, 4-hour and all-day outings. 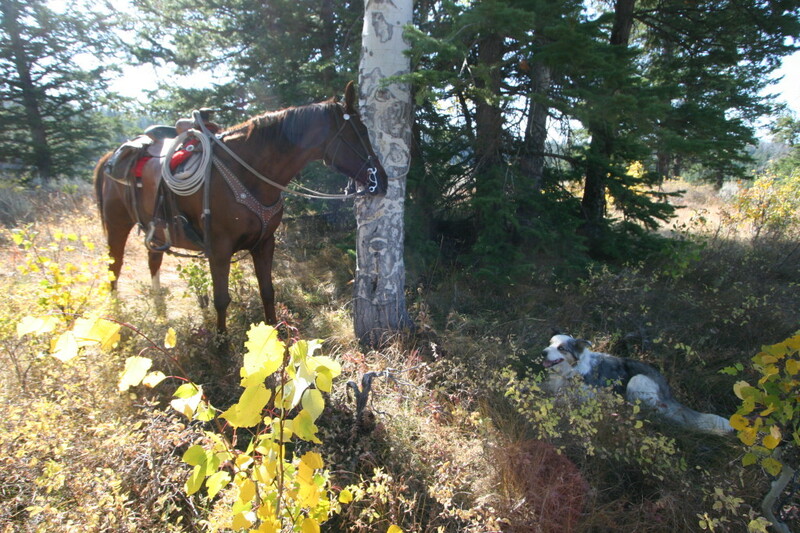 I do the half-day “trail ride”, though the vast majority of the trip is on no discernible trail. We pick our way through forests and over fallen trees, ford a broad stream, climb steep hills and bushwhack our way up to some stunning views. It’s by far the most enjoyable and scenic ride I’ve ever taken. On our 5-hour, 10-mile trip we don’t encounter a single human being. 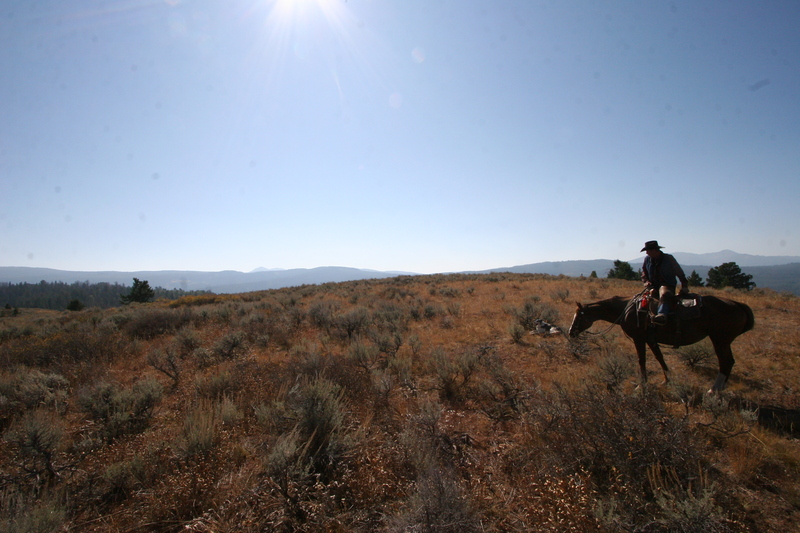 Sitting astride my horse on a high hill overlooking the untouched wilderness, I behold inspiring views that likely looked just the same a thousand years ago. The fires lurking in the park haven’t yet grown ambitious by this point, and the air is sweet with sage and pine. I think briefly of the crowds that stick mostly to the town of Jackson or the day-tripping campers with their Winnebagos, and I feel lucky to be where I am. I expected to be sore after a five-hour ride—and after more than four years since I’d last ridden – but instead I feel refreshed by the work of it, my body’s memory of that relationship between horse and rider reawakened by the experience. On the advice of my hosts, I have dinner at Rendezvous Bistro. This is an upscale eatery in downtown Jackson that generously tolerates the jeaned and booted, but I counted as many Italian suits and Chanel handbags here as I did snakeskin belts. The tony clientele is a reminder that Harrison Ford lives just up the road, as does Sandra Bullock, Tiger Woods, and a host of other celebrities. But forget all of that; the food is the focus here. The wine list is thoughtfully balanced and impressive – I had a killer Malbec – and the wild boar spare ribs heavenly, as is the venison in a pomegranate port wine sauce. After roaming the backcountry, dining in such an urban setting seems newly exotic by comparison. 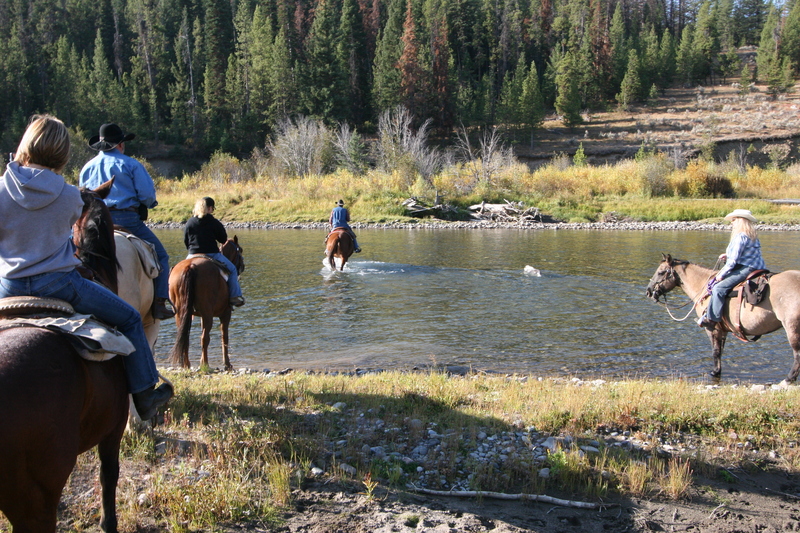 No visit here is complete without an extended float down the magnificent Snake River, a clear, cold tributary that cuts a serpentine path through the valley. Many climb aboard large circular inner-tube craft of the sort popular in water parks, with ten or more people strapped in, all facing each other when they should be facing out. 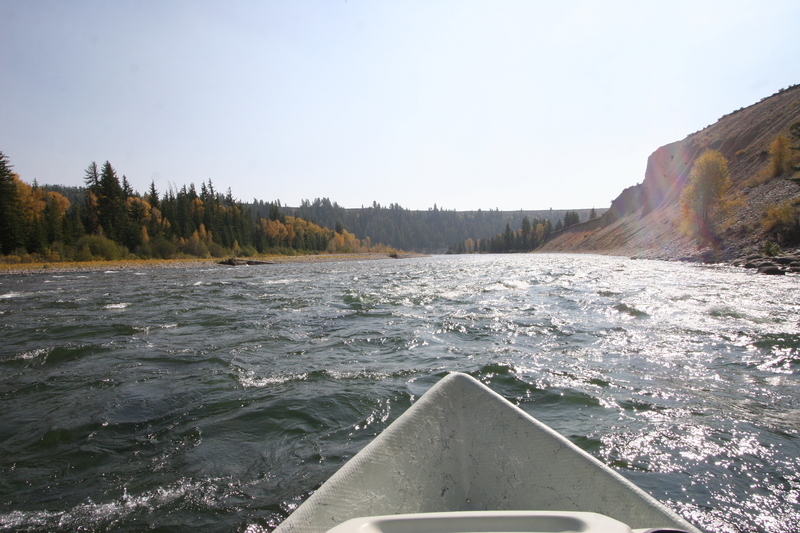 A far better bet is to see the river by private boat. My guide J.B. of Fish the Fly knows the river intimately, and provides a fascinating tutorial on the role of the Snake River in the life of the park. And, as you might have guessed, he also knows where the fish hang out. J.B. is so confident of the fish’s locations that you’d think he delivered their mail to them. 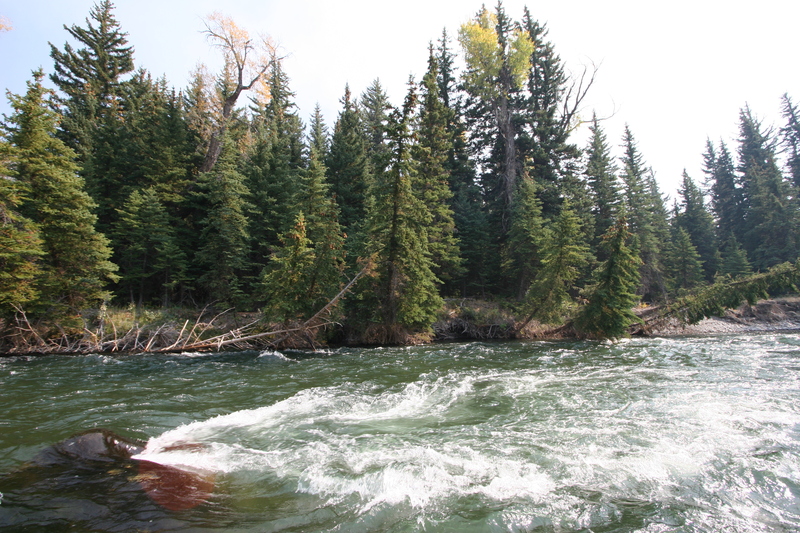 I get many bites, and if I were a more skilled fly fisherman I would have converted more of them, but I still catch two beautiful native cutthroat trout, both returned to the water for future anglers to enjoy or bears to devour. I also, thrillingly, catch a very expensive professional fisherman’s hat, exquisitely decorated with hand-tied trout flies, while the long-suffering owner who is wearing it sits in the rear of my boat. This, too, is thrown back. True story. This was no mere fishing expedition. We drift past dry beds abandoned by the river from the previous year, and see stands of trees newly swamped as the fast water improvises a path on its long journey to join the Columbia River and the Pacific Ocean beyond. 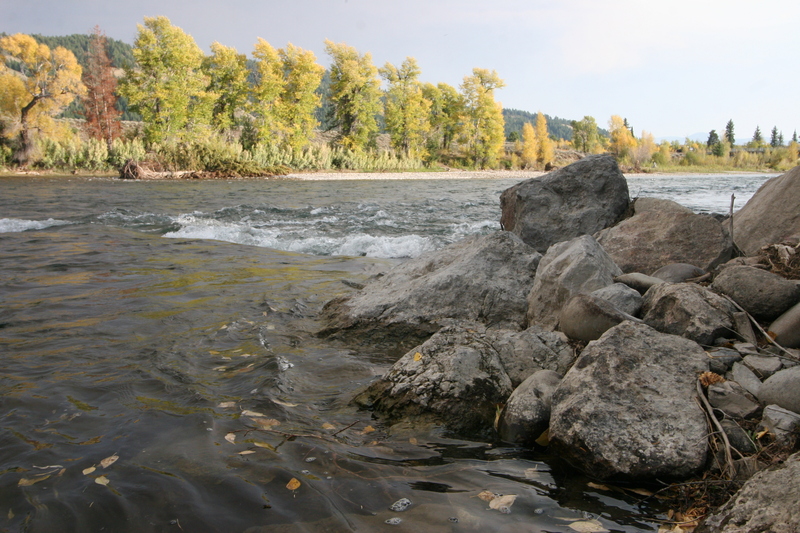 The river reinvents itself every year, and the land adapts and thrives around those changes. 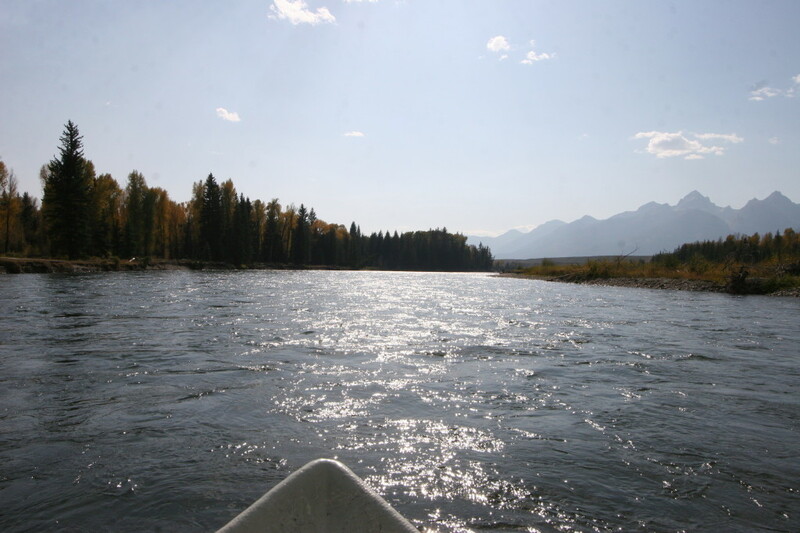 For the river, there is no bad or good course; there is only the way forward. Fish the Fly provides everything you could need, and can pick you up and drop you back at the Inn when you’re done. By the time J.B. returns me to the Bentwood Inn I’m ravenous. 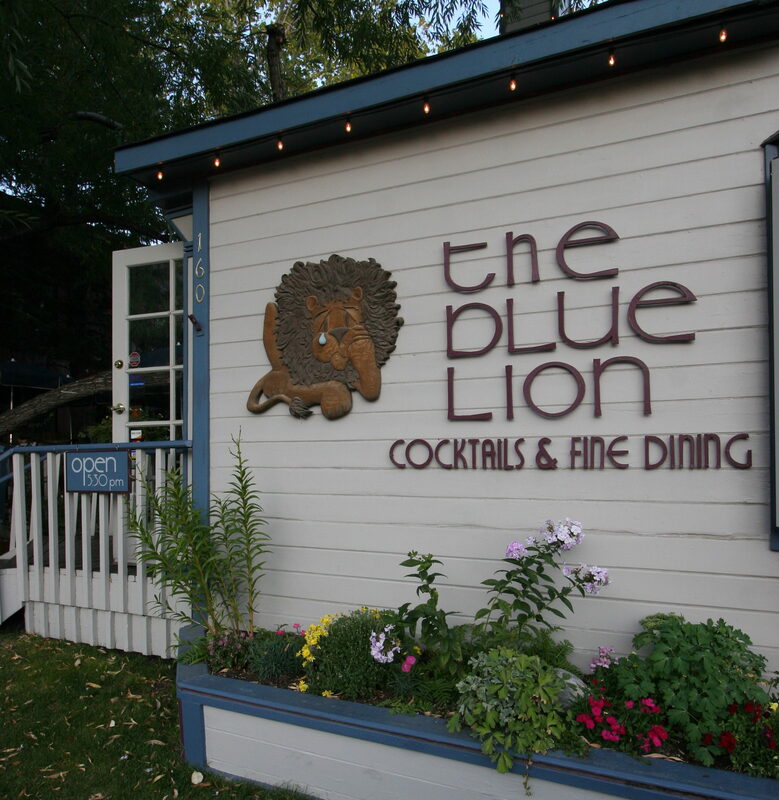 Everyone will tell you to eat at the Blue Lion. Listen to them. 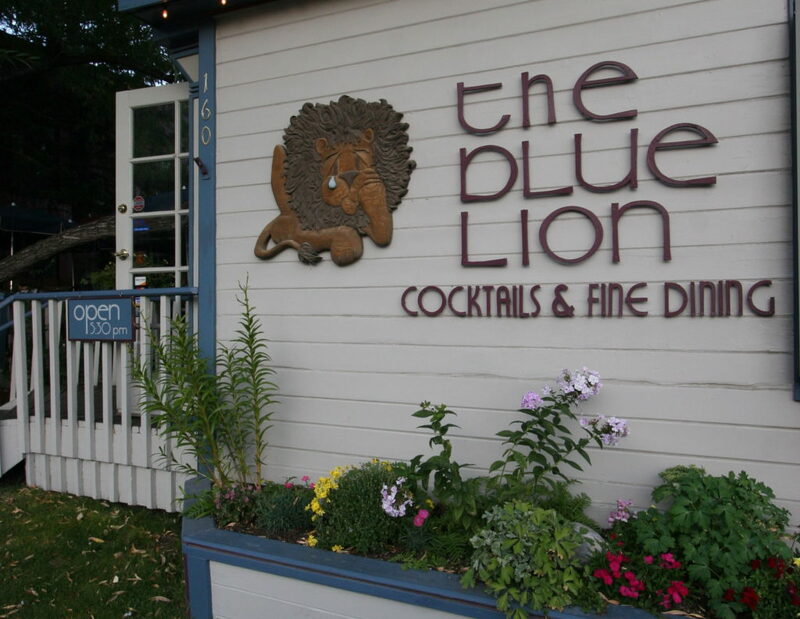 Owner Ned Brown is considered one of the old guard of restaurateurs around here, and there is a casual hominess to the setting and the fresh, unpretentious food that provides a link between the small town that Jackson once was and the playground of the rich and famous it has become. 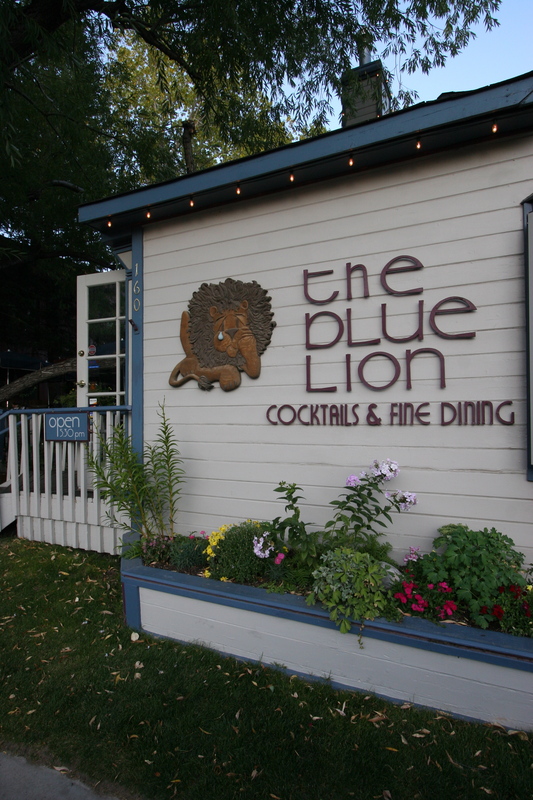 Eat at the Blue Lion. On my last day, my wilderness guide, Taylor, of Eco-Tour Adventures, picks me up before dawn for an opportunity to catch a glimpse of some majestic park wildlife. He fortifies us with homemade scones and muffins and miraculously produces a French-press coffeepot from the trunk of his Land Rover. While we feast he gives a quick chronological and geological history of the park and lists the species we are likely to see today. Fifteen minutes later, we softly crunch through a wood to the edge of a clearing still glistening with dew and draped in a light morning fog. Suddenly we hear the unearthly sound of bugling elk echoing across the meadow — two males in rut are talking smack to each other from opposite ends of the glade. The haunting cries continue, but they seem to come from everywhere at once. “They’ve moving,” Taylor whispers, and moments later we see a harem of females break cover with a huge male escorting them. A second cry from quite near us makes him stop and turn to listen, trying, as are we, to pinpoint the location of the other male. Taylor offers me the big-boy telescope he has set up, and looking through it, even from this distance, the big elk is incredibly imposing; the soap opera rivalry between the two competing bucks is fascinating. 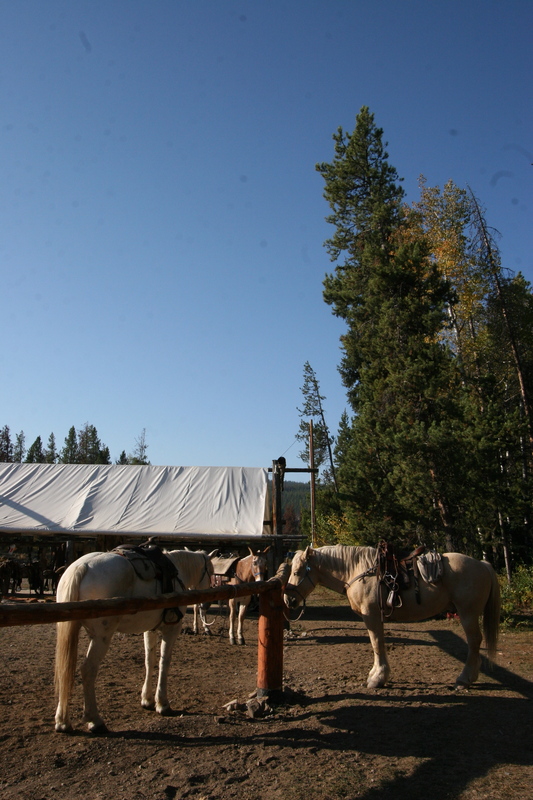 Before the morning is over we will sight black bears, pronghorn sheep, and even a moose. But my thoughts keep returning to that contest between the huge elks. One male will win and one will lose, but the herd, as a whole, moves on. As we walk, I share my sadness over the forest fires with Taylor. 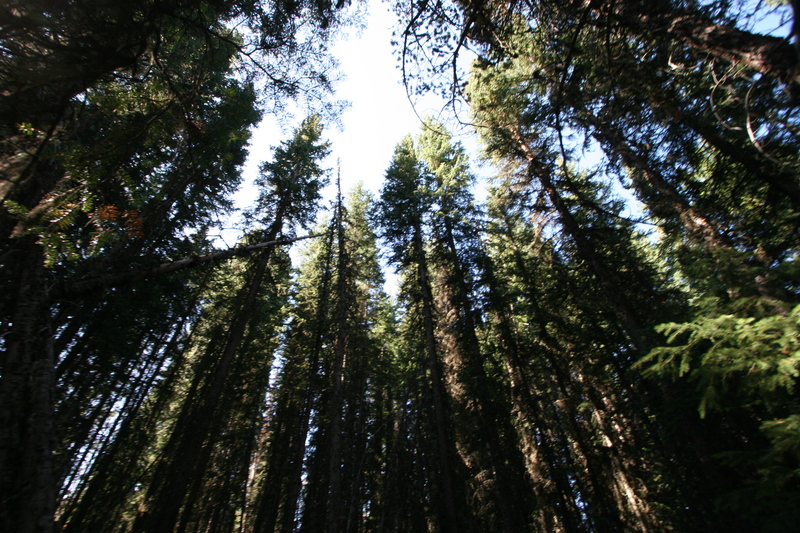 He tells me how the good intentions of the forest service actually harmed the park in the early part of the 20th century, how of the seven varieties of trees in the park, two are actually fire-dependent, and cannot reproduce without the help of forest fires. He tells me that I need to go hike up to Taggert Lake and see for myself. Later that afternoon, I do exactly that. Twenty-five years ago, shortly after the new progressive, hands-off attitude toward fires was adopted, the approach got its first real test. 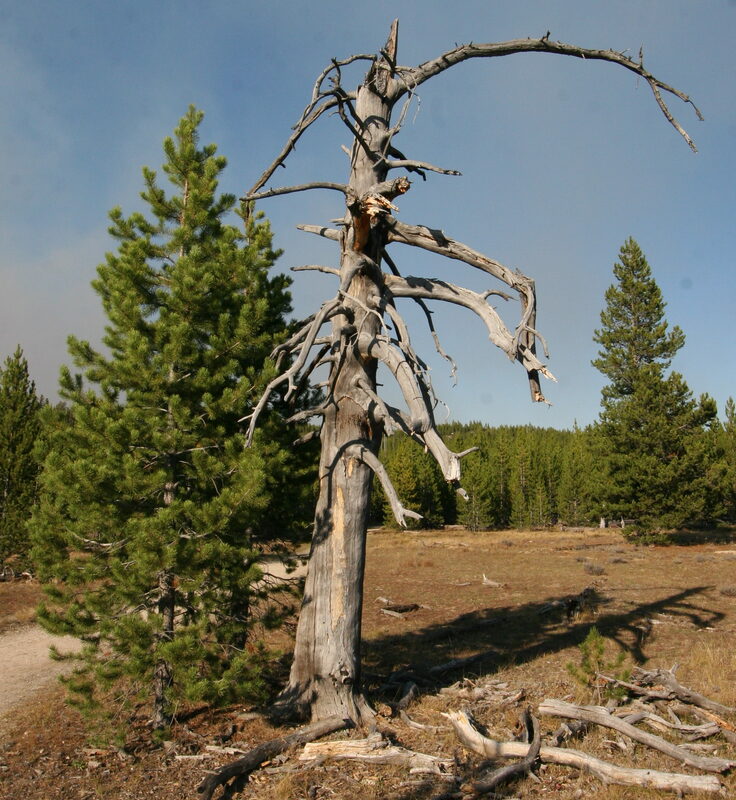 A lightning strike set the magnificent woods around Taggert Lake afire, and with decades of overgrown forest, the damage was catastrophic, transforming the beautiful habitat into a lunar landscape. But now the woods have begun to return. 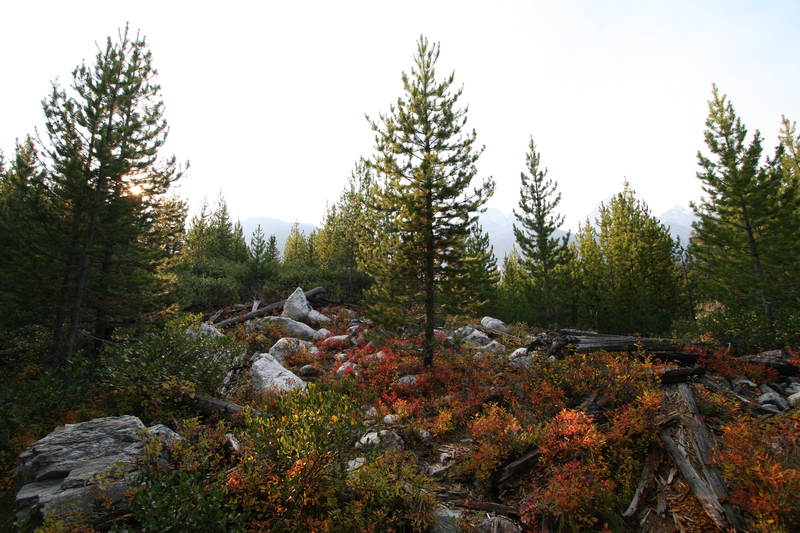 With the mature lodgepole pines dead, the brilliant Aspens, once relegated to the understory and struggling for light and life, have regenerated around the skeletal remains of the felled pines, a new nursery in an old graveyard. 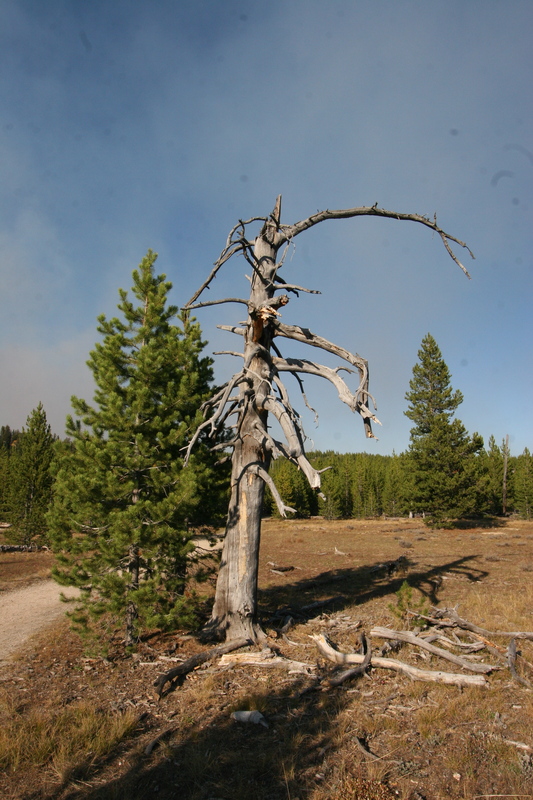 Meanwhile, the Lodgepole pines cannot release their seeds without the extreme heat generated by a forest fire, and so finally did so after decades of waiting. 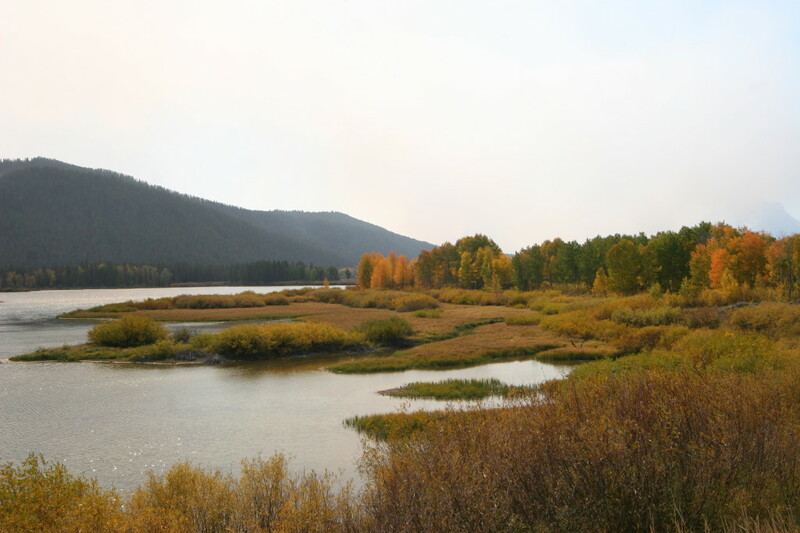 Eventually the Lodgepole pines will catch up to the Aspens and crowd them out again, but sooner or later another fire will arrive to restore the balance. And the rangers, now wiser, will sit back and watch it happen. Both species need the fire to survive. 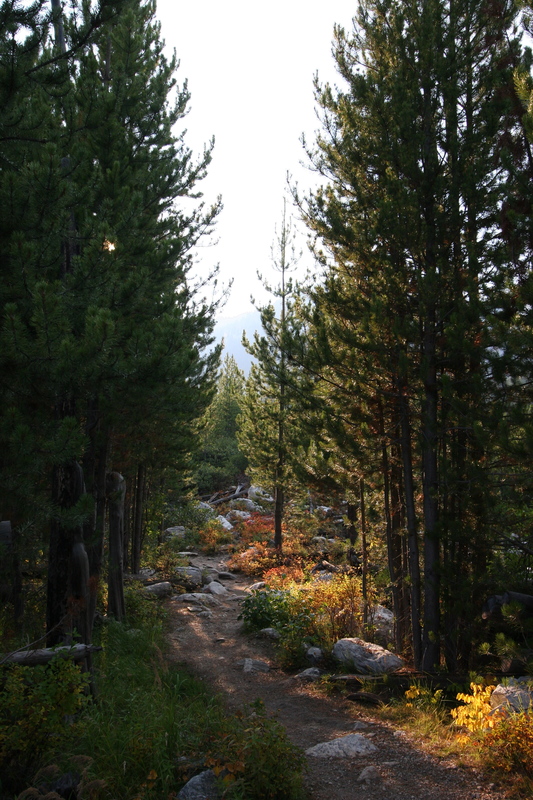 There is no beautiful forest without the conflagration, and on the long walk to Taggert Lake, you can see the gifts from the fire. The fires are dying out as I head home. I look across at the Cathedral Group and the skies are clear once more. The blazes didn’t do any lasting damage, none of them do, and what change they have brought to the park will be to its benefit, spurring the emergence of new life that has lain in wait for just such an opportunity. 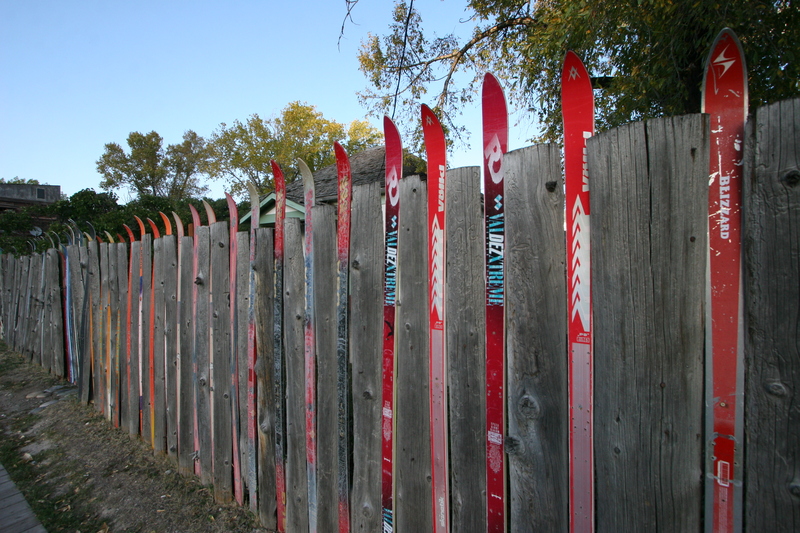 The wind is shifting; soon the snows will descend, the skiers will arrive in force, and the area will take on an entirely different character than it has here in late September. 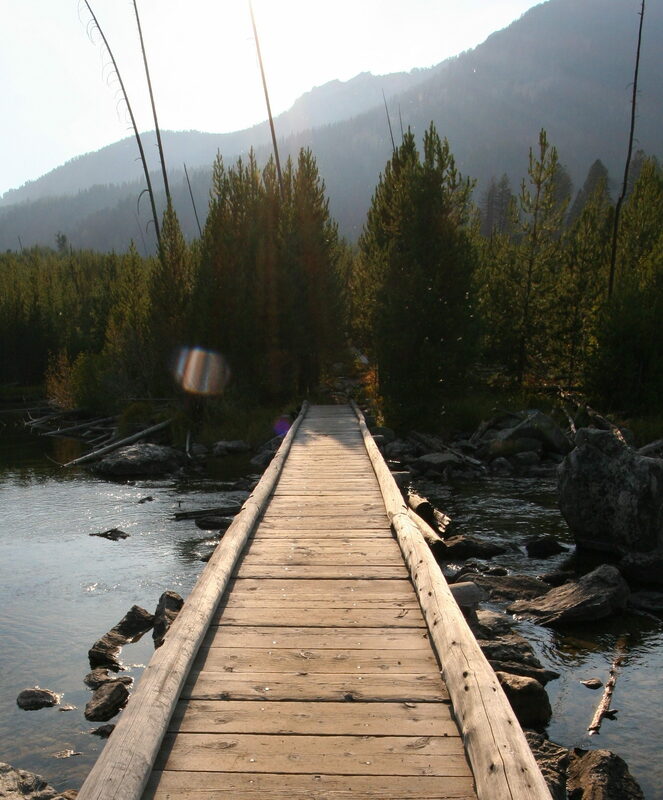 I traveled to Grand Teton expecting a pleasant walk in the woods, and came away spiritually renewed. I know I’m coming back. After all, the cathedral is always open. And always changing. 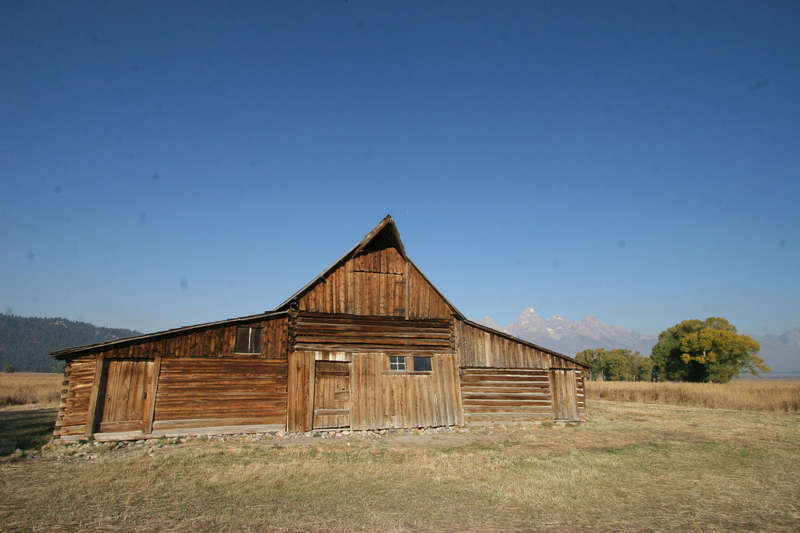 Click below for a slide show with more great views of Grand Teton National Park. J. 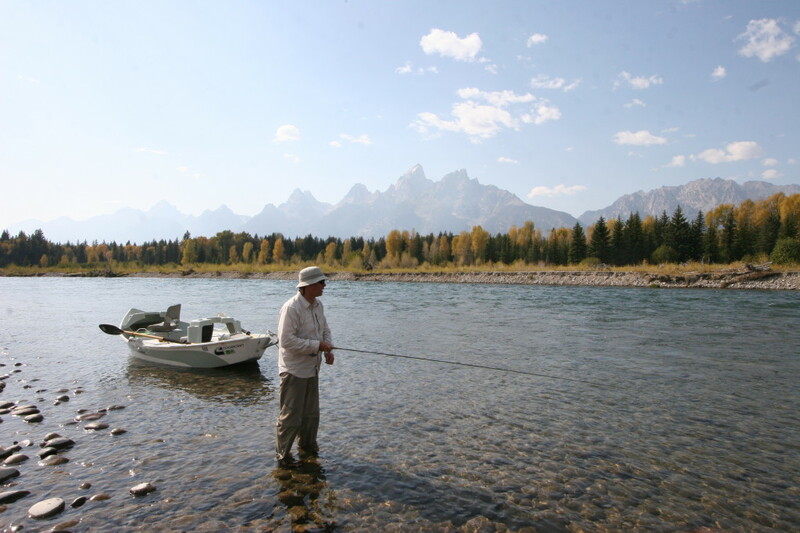 B. of Fish The Fly angling for trout on the Snake River. 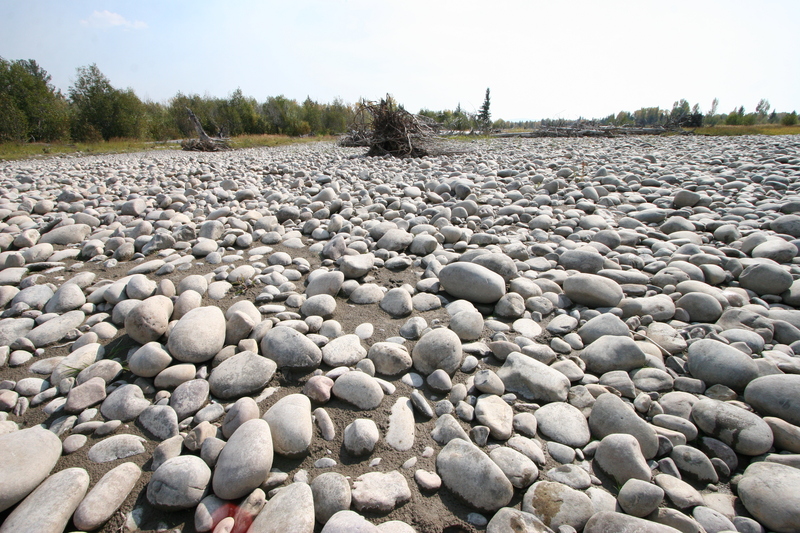 Dry beds abandoned by the river as it unpredictably changes course from year to year. Fantastic food at The Blue Lion in the town of Jackson. 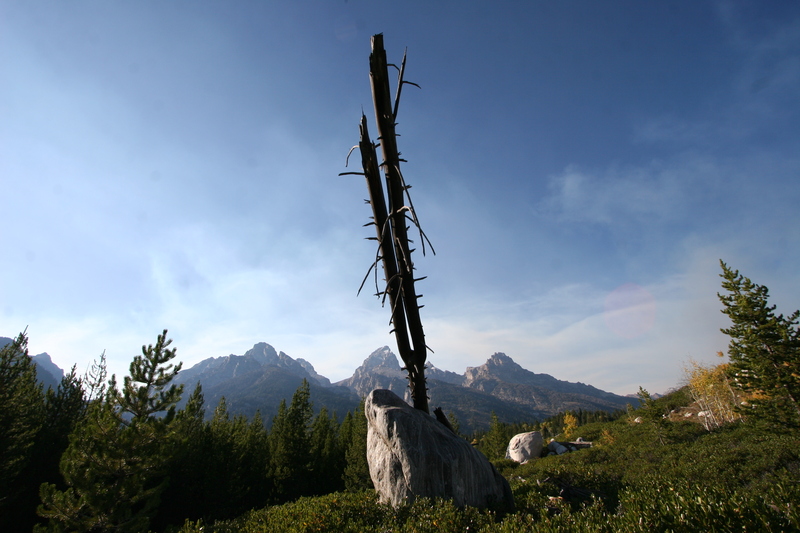 A new lodgepole pine grows next to the ruin of a dead one burned decades ago in the fire. The only two people I encountered along the trail to Taggert Lake. When you visit the park in September, you have the place mostly to yourself. 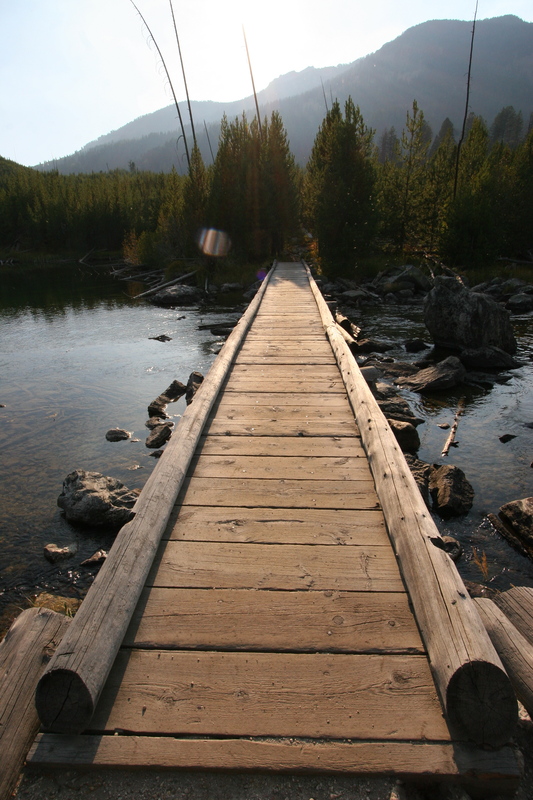 A bridge crossing the water at Taggert Lake. 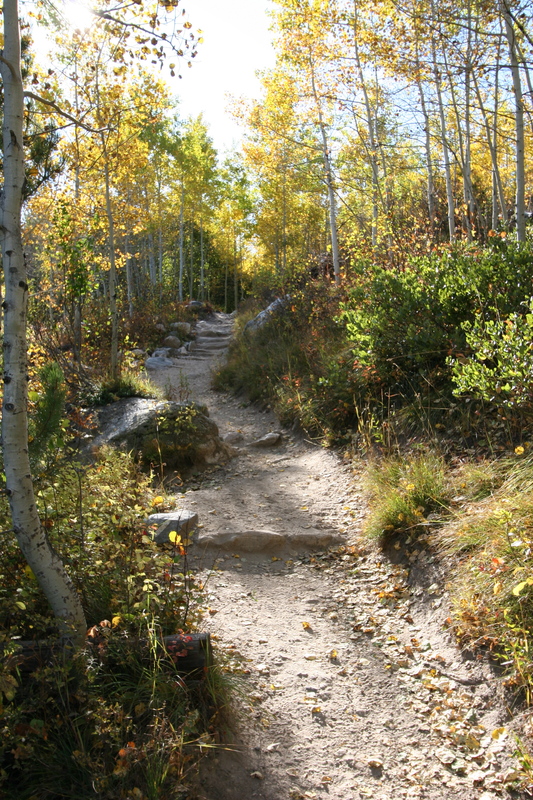 The Trail to Taggert Lake.